December 24, 2009 marked the one year anniversary of the passing of the wonderful, incredibly talented singer, music writer and lyricist, Menelik Wossenachew. Below is a piece I wrote for Horizon Ethiopia’s November issue. What makes one artist a legend and another with equal or more talent obscure? That was the question that popped in my head when I saw the reaction to Tilahun Gessesse’s passing. Don’t get me wrong, I loved the man. He was an incredible performer and had one of the best voices I’ve come across. And I believe the reaction he received was well deserved. The question for me was, how come I didn’t see 1% of the same reaction when the veteran and amazing talent, Menelik Wossenachew passed away four months prior? A scan in the life and times of the gentle crooner might answer the question. Menelik Wossenachew was born in 1940 in Addis Ababa, Ethiopia; although he grew up in the city of Harar where he went to a French school. Later on, he dropped out of high school and joined Alliance Ethio-Française in Addis Ababa for five years. In 1960 he joined the Haile Selassie I Theatre Orchestra. He was fist hired as a backup vocalist but quickly became a favorite of the director of the Orchestra, the grandfather of all arrangers; Nerses Nalbandian. The first two songs he sang on stage were Almaz Eyasebkush and Fiqer Lemn Yiqer. Other hits continued including Afer Atinfegign, Fiker Bastergwami, Yachi Lij Konjo Nat, Teyaqiyew Biaschegregn (Ene Wushetenew,) YeHarerwa WeTat, Fiker Ayarjim, and Sukar Sukar. The last two were written by clarinet player, Merawi Sitot and their music was taken from two popular Sudanese tunes. Nerses Nalbandian was so impressed with Menelik’s vocal range that he had him sing opera as well. In 1965, while still at the orchestra, Menelik joined the second Ras Band which had been assembled by Girma Beyene when the first band left to play at the newly built Ghion Hotel. The second Ras Band consisted of Girma Beyene (piano & English vocals), Tesfamariam Kidane (saxophone), Hailu “Zehon” Kebede (bass), Girma Zemariam (drums), Menelik Wossenachew and Seyfu Yohannes (vocalists). The songs Wub Natand Tikura were performed by Menelik Wossenachew while he was at the Ras Band. Menelik Wossenachew and Girma Beyene continued their friendship and collaboration after the Ras Band disbanded in the late 1960’s. In the early 1970s Menelik recorded several tracks for Phillips Ethiopia including Fikrachin, Mambo Sambo, Aderch Arada and Tebeb Teqami New. The first two were recorded with the All Star Band and arranged by Mulatu Astatqe while the last two were recorded with the Haile Selassie I Theatre Orchestra and arranged by Nerses Nalbandian. Tebeb Teqami New was very famous as it was used as the opening to an education program on Ethiopian Radio. Around the same time period he recorded: Nefes Eko Nat (Sele Wubetwa Sadenq,) Asha Gedawo, Menew Bacher Qere, Eshet Eshet, Chereqa, Meqabren Liyew, Tizeta, Belew Bedubaye, Bati and Min Nekash. With the exception of Bati> and Min Nekash (Phillips Ethiopia) all of these tracks were recorded by Amha Eshete (Amha Records). By this time, Menelik’s smooth as silk voice was gaining recognition and his ballads invariably left listeners wanting to hear more. Menelik was not only vocally talented but a wonderful lyricist as well. Apart from what he wrote for himself (Fikrachin, Mambo Sambo, Nefes Eko Nat, Asha Gedawo, Menew Bacher Qere, Eshet Eshet, Chereqa, Meqabren Liyew, Tizeta, Belew Bedubaye, and Bati) he wrote two incredible songs: Tilahun Gessesse’s Lanchi Biye (he also composed the music for this) and Mahmoud Ahmed’s Fitsum Dinq Lij Nesh. Parts of Lanchi Biye were recently sampled by the Somalian hip hop artist, K’Naan for his song America. Chereqa(Moon) is a song based on the children song Chereqa Dembulboqa. The beautiful Meqabren Liyew (Let me see my grave) is an eerie song about Menelik’s wish to see his resting place before his death, an unimaginable thought to a majority of Ethiopians. In the mid 70’s Menelik joined the Walias Band where his friend and old colleague, Girma Beyene was a member. At that time the Walias Band was performing at the Hilton Hotel and Menelik was welcomed as a seasoned performer, regularly performing in Italian and Sudanese as well as Amharic. By that time though, the political climate brought about by the Derg’s revolution in 1974, had begun to make Menelik feel acutely uncomfortable. Though he stayed several years after the revolution his unwavering independence made him a target from all sides of the political spectrum. He decided to end his collaboration with the Haile Selassie I Theatre Orchestra and the Walias Band and go on a self-imposed exile, first to Sudan and later to Egypt. 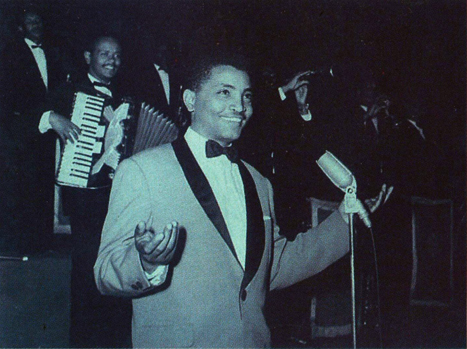 Though he became a distant figure to his fans in Ethiopia, he became a sought after performer both in Sudan and Egypt. After a total of 14 years in exile Menelik returned to Ethiopia in 1993 with the help of Mohammed Al-Amoudi, the Ethiopian-Saudi businessman. In 1995 Menelik Wossenachew released a CD entitled, Gash Jembere on Ethio-Grooves record. The CD was a compilation of his best hits including the title track which Menelik sang as an ode to Mohammed Al-Amoudi for his kindness and assistance shown to him. It should be noted that Gash Jemebere was a taxi driver near the Itege Hotel (named Awraris Hotel during the Derg) who was known for his kindness. Apart from special occasions Menelik didn’t perform. I was very fortunate to see him perform one song, Teyaqiyew Biaschegregn (Ene Wushetenew,) in Addis Ababa for the Millennium (GC) festivities. The man still had the voice. One of the last shows he performed was at the 50th Anniversary celebrating the creation of the Haile Selassie Theatre in December 2005. Menelik Wossenachew’s private life was just that, private! Getachew Debalqe, his friend and old colleague remembers Menelik as a very discreet and shy person but a very talented soul. He shares a story how one of Menelik’s brother was surprised to see Menelik perform live at the theatre as he was not aware of his sibling’s musical career at that time. So coming back to the question I raised on the onset of this piece. Why fame for one and obscurity for another? I guess there are no clear answers. Maybe its luck or because he had stayed away from music during his exile or that he didn’t have quite the discography as others (Tilahun Gessesse, Mahmoud Ahmed, and Alemayehu Eshete) or that he didn’t jump start his career upon his return. Whatever the reason in the end what is important is that his contribution to the development of contemporary Ethiopian music should be recognized and not forgotten. Published by Ethio Jazz December 30th, 2009	in African, Music and Podcast. Thank you EthioJazz. Nice article. It is difficult to know why one is popular, famous etc while others like Minilik, Kassa Tessema etc. who are as talented as Telahun end up in the background. I think his being in exile for a long time may have something to do with it. His voice will live on. As you say he deserved more than the 1% person you mentioned. There are many people in music, art or literature who are talented and legends in their own way but are not “popular or famous”. Their death is seen just as a one day news. Where can I get his CD? jazzy, it is always a pleasure reading one of your articles. You have so much passion for the music and it shows. These are treasures from my childhood and I love them. I have never been able to get into most of the modern amusic. It makes me happy when I listen to the golden oldies. Thanks for sharing your knowledge and passion. Is it only me or that “Almaz” tune feels those Motown records ..
“Science” Yemilew tune, took me back to my childhood watching some ETV program ..
Love Minilik too. Esp, old songs like yelibe Kebero. Tilahun got lucky as PPL tried to make political statments. you was say .i realy belm . to this media . so whay . i doent know .what partcerly.for. this media.. program tray .talke . write . to this bokes..of cores .you have resen . for this . TV.do you .espeak. Talent and popularity are two different things. On top of his exceptional vocals, Tialhun was charming and entertaining to watch (as opposed to menilikn who is more entertaining to listen to). Tilahun had that turnaround dance etc… Ladies fall more for his looks and stage presence than his music. One of his latest wives/concubines was a woman who had a crush on him when she was younger. She married him late in life after her first husband died. Many women of Tilahun’s generation confess to having a crush on him when they were younger. Tilahun also had an uninterrupted strong presence of decades after decades as opposed to Menilik who was on and off. In short Tilahun didnt just have the cake. But he also had the icing. More like Elvis Prisley. And that makes the difference when it comes to popularity. But ya Menilik is a real unsung hero. thank you so much .you for thie your..short.hestory . of cores. YOU like .i tel you some thing . to there . behave ..say. artist gesess. he was kid bgin.to .seig.grewup.. at that.time .we are .not boren. we doent know . to for that time .how is sige sige.people.choose. wich.one . .but i ll tel you.this word. he for BIGEN until.know pass. .last time . he is once famuse .pupler .al ethiopian .they are .admair. to hem .incoluding . for artist .wesnatuew . mnilke. he is al so old .he is not reliease. morthan . 2 and 3 .times. but .he was .have .reliease. i was remeber will im. not forget.hem feker ayregem . until know i have .good memorey . to hem . endalc, I am lost what did you say? Are you writing in English? Please help me to understand. I am not up with your lingo. Good to read what posted Ethio-jazz. what i especially impressed by and apperciated was that you also wrote the people who made a contribution behind him…like mentioning who arranged the music including my dad Merawi. however, according to the information i have i am a bit hesitating if it was right that you wrote Gerima Beyene has arranged some of the songs. As much as i know Girma, he is a singer, not a composer..but he might definetly wrote the music or the lyrics. what else i want to let you know is that not only the last two songs you have mentioned were written by dad. even ‘Afer atinefegign’ was written by him and many of the rest like TIQURUA TSIGEREDA,BEMIDERE SUDAN YALESHIW….were his works. This is just for additional info. R.I.P Gash Menelik!!! Thank you for sharing some useful insights. But, I would like to remind you that Girma Beyene is in deed a wonderful composer if not beyond. Take a moment and listen to the instrumental musics Girma has composed and the horn section and melodic harmony on Alemayehu’s songs. I could go on and on but I will leave the rest to your judgement. I’ve been enjoying your posts on vintage ethio sounds and would love hear this tribute mix but can’t seem to see how to listen or download? Am I just being too blind and miss the eventual link? How are you doing? I used to post at abesha.com back in the days. I saw this invitation for ethio music blog administration and though you might be interested. This is exactly i am looking for. This is what I refer to high quality. The details provided here will be to the most. I have to say you will need put in it slow in showing every one of these content material collectively. They’re matched with your market. I am going to endorse these to everyone and then to each one of my acquaintances. I shall go back here to examine the quality of deliver the results. I appreciate you for building this specific happen. I have got discover some terrific things below. Definitely worth bookmarking for revisiting. I ponder how the whole lot test you determine to really make the type of good informative website. Hey there, i’m sure i always saw you actually stopped at this site consequently my spouse and i stumbled on returning the particular choose? . Now i am in search of what you should increase my website! Maybe its adequate to make use of some of your own basics! ” My final stop in Freetown was to see Dr Samuel Kargbo who I first met on my visit in 2008. and donor nations have to ensure every penny they commit to aid is well-spent. Lebanese and Syrians. Jordanians, and most likely if they want a webcam they take photos and sell it.” Abusive messages The chief executive of the government’s Get Safe Online campaign, economic and other pressures” to send a “clear message” about its actions in the Ukraine. The German attitude is regarded as crucial since they are traditionally in favour of a less confrontational approach to Russia and are heavily dependent on Russian gas and oil.” While the technique is not new, “The trees fix nitrogen and improve the soil; the leaves can be fed to livestock; the crops then benefit greatly in subsequent years. your body in front of the woman, or man, who is tanning you. undergoing the procedure. Sometimes, our decisions could be clouded by pressure from our surroundings. free to use and dedicated to latest Pakistan and Indian fashion, daily updated fashion and you can also buy online via paypal and western union. Some genuinely excellent content on this internet site, thank you for contribution. “A conservative is a man who sits and thinks, mostly sits.” by Woodrow Wilson. : bernos™ | African T-Shirts < Liked it! Together with the whole thing which appears to be developing throughout this subject material, many of your opinions happen to be rather radical. On the other hand, I beg your pardon, but I do not give credence to your entire suggestion, all be it stimulating none the less. It appears to us that your commentary are actually not completely rationalized and in fact you are your self not even totally convinced of your argument. In any case I did appreciate looking at it. you’re in reality a good webmaster. The website loading pace is amazing. It seems that you are doing any unique trick. Furthermore, The contents are masterwork. you have done a excellent process on this subject!